At least 19 people were killed in Wednesday's attack including a yet-unnamed U.S. military contractor; Army Chief Warrant Officer 2 Jonathan R. Farmer, 37, of Boynton Beach, Fla.; Navy Chief Cryptologic Technician (Interpretive) Shannon M. Kent, 35, of upstate New York, and Scott A. Wirtz of St. Louis, Mo., a civilian operations support specialist working for the Defense Intelligence Agency. Three other U.S. service members were wounded in the bombing of a popular restaurant in the city of Manbij. 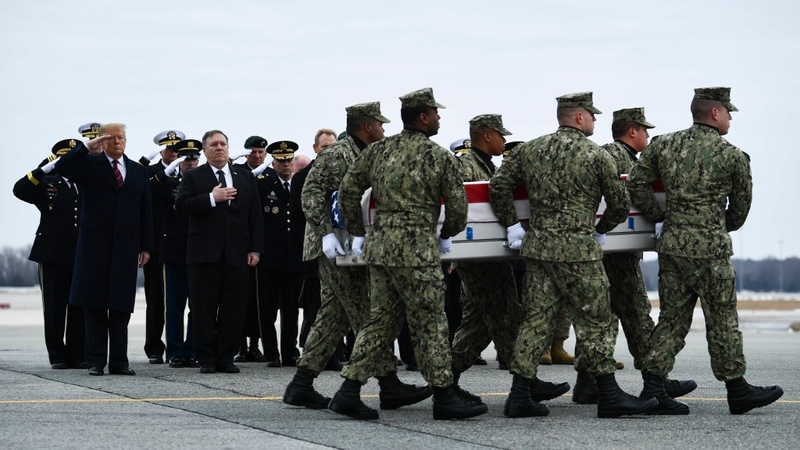 This is Trump's second visit to the Delaware Air Force base to witness a dignified transfer, as the return of remains is known. In February of 2017, he paid his respects to Navy SEAL William "Ryan" Owens who was killed during a U.S. raid in Yemen. The Islamic State claimed responsibility for this week's bombing — Saturday's ceremony comes exactly one month after Trump declared victory over the group. But as he left the White House for Dover on Saturday morning, he told reporters that the U.S. has been "hitting ISIS very hard over the last three weeks." On Saturday afternoon, the president will make what he bills as a "major announcement" regarding border security and an ongoing partial government shutdown – the longest in American history. The White House has not provided further details on what the speech will address.